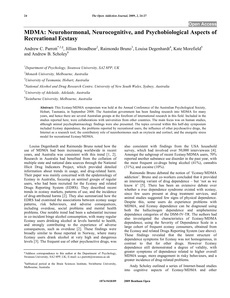 This Ecstasy/MDMA symposium was held at the Annual Conference of the Australian Psychological Society, Hobart, Tasmania, in September 2008. The Australian government has been funding research into MDMA for many years, and hence there are several Australian groups at the forefront of international research in this field. Included in the studies reported here, were collaborations with universities from other countries. The main focus was on human studies, although animal psychopharmacology findings were also presented. The topics covered within this half-day symposium included Ecstasy dependence, the problems reported by recreational users, the influence of other psychoactive drugs, the Internet as a research tool, the contributory role of neurohormones such as oxytocin and cortisol, and the energetic stress model for recreational Ecstasy/MDMA.